Only I had this really weird dream. It wasn’t the first bit which began as a marvellous swash buckle of an adventure but which quickly became too surreal and annoying to be much fun. Sleepily I followed Grace into the kitchen to feed her and noticed she had a large notice in pink writing stuck to her back. Realising I was STILL dreaming I looked closely and although blurred saw it was an invoice for my previous swash buckle dream. My subconscious had just invoiced me for a rubbish dream?! How long has this been going on? Where can I complain? So that appointment for the sleep clinic rattled up to my door pretty quickly. After finding a dear friend to take the hound for the night I arrived somewhat anxious unsure of where they were going to stick what monitor. Turns out I needn’t have worried. I was not on the ward with the rest of the sleep deprived. I was in the ‘disabled’ ward down by the nurses’ station with en-suite and a dud radiator. It was freezing but worth the privacy. 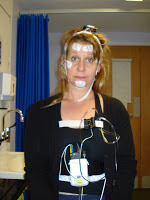 A skinny, nervous man came down and stuck electrodes all over my head and legs and strapped some device to my chest. It is a strangely intimate process and the man insisted on rather gushing small talk. ‘I always try to chat with the patients,’ he said reaching under my arms to pass several wires down my t-shirt. ‘It helps put them at their ease.’‘Really?’ I asked, feeling a little like I was in a play and there was a line I should respond with but hadn’t learnt. What does one say? 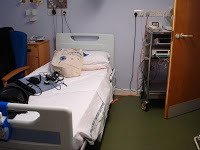 Eventually I blagged an extra blanket from the nurses and was hooked up to the lap top by the bed and told to get some sleep. The next day they did additional sleepiness tests which involved being asked to go back to sleep for 20 minutes every two hours but half way through I had a call from my lovely pal who had taken Grace. Grace was sick and I had to end the study and get back home. I did learn I have mild sleep apnea and my circadian sleep pattern is up the yazoo but more on that anon. I had to rush home.And Grace was very sick. Voiding from both ends and exhausted. If she lay still she was alright but any movement caused her so much discomfort that she became agitated trying to lie, sit, stand, walk and climb up into my lap. She has now seen the vet and is on the mend but it was a pretty horrible time for her and we are still not sure what caused it or if it is in anyway connected to her previous bouts of sickness. So she is on a very strict rice and boiled chicken diet and was looking perkier …until I nipped out to the shops last night and she managed to find and eat almost an entire pat of butter plus foil wrapping that I had left in the kit chen to defrost. Oddly enough she is now looking a bit uncomfortable again…. Ahh the joys of a dog’s digestive system. Dontcha just LURVE my blog?!! Agh – poor Grace and poor you! Love the dream though; how much did your swashbuckling cost? I've never been charged for MY dreams – and I've had some doozies! Hope Grace gets straightened out soon. Poor puppy! And poor you! 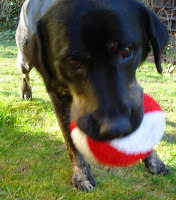 poor lovely Grace – hope she is better now and your sleep patterns can relax? haha! I think Grace is the one who needs tests. 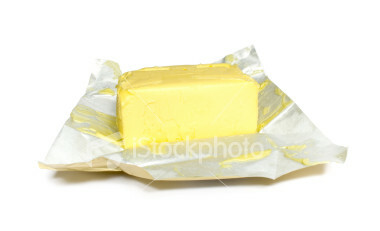 Why on earth would a seeing eye dog want to eat a block of butter plus wrapping? Odd. Maybe she needs a dog whisperer! So, are you going back for more sleep tests? I think we all have sleep apnea from time to time, especially if you tend to snore like me and my hubby! Oh no, I hope Grace gets better soon for both your sakes — and what an adventure the sleep tests have been! Perhaps that's what the invoice was: Grace's illness being the price you paid for sleeping in a lab? But you're right, what an odd dream to have. That dream is a classic! Poor Grace, I hope she's feeling better again by now. She must have had a terrible craving for some unhealthy food!